There IS a difference in veterinary care! Thank you for visiting Angel Animal Hospital! Click the “Play” button above to view a video tour of our location. We value the human-animal bond and look forward to serving your veterinary needs in our clean, safe, state-of-the-art facility. We understand the special role your pet plays in your family and are dedicated to becoming your partner in your pet’s health care. We truly believe there IS a difference in veterinary care and we treat your pet as we would our own. Our goal is to practice the highest quality medicine, dentistry, and surgery with compassion and an emphasis on client education. Call (317) 888-6435 or come in and visit us today. I will never take my pets anywhere else but here. They are the most caring and patient animal hospital and every member of their staff is incredible. I know that they listen to any concerns and issues I may have, they understand how important my dog is to me, and are genuine and communicate very openly. Wow, feels like a resort in south Florida, very fancy and clean. Vet very nice. Compassionate staff, shout out to Korri. They were very nice helping my old sick dog pass gently. Beautiful place. My regular vet would not squeeze me in when my Cavalier had an eye infection. worried about his sight i called around and nobody would see me except for Angel Animal. the wait was a little long but after all they did squeeze me in. The staff and vet were wonderful, they were so good to my little fur baby and the drops she gave me cleared his eye up that same day. Guess who my new vet is? I had to put my kitty down that I had ever since I was 7 years old! It was one of the hardest things I have ever had to do. The staff at Angel Animal Hospital were so kind, understanding, and sincere. They definitely took care of my baby when she needed it the most. Would recommend for all types of veterinary visits, they will take care of your fur babies! We really like but what keeps us coming back is Dr. Lehmann and the wonderful vet techs who walk us back and help out with appointments. Dr. Lehmann is so thorough and loving to our dogs and we trust her completely. We like the overall clinic as well but I'm sure there are plenty of lovely clinics around! We really just love her and appreciate the care we get with her every time! My name is Vanessy Cortes.I’ve always been leery taking my cats to the vet. With videos and stuff you see on the internet (yes, it is to my detriment), you can see why any person who truly loves their pets can be a bit suspicious. And when I say truly loves, I love my cats like they are my kids! But when it came to Angels Animal Hospital, from the dr, to the vet assistant, and down to the receptionist; I felt nothing but sincere care towards my cat Caesar. I took him in because I felt that he had respiratory problems and just knew he wasn’t feeling himself, Dr. Clark diagnosed him. With a proper exam and X-rays, she couldn’t find what was wrong with them. Still, in my heart I knew there was something wrong. She proscribed antibiotics and sent us on our way. Going home,i still felt a bit skeptical and sad because I knew Caesar was sick and we couldn’t find what was wrong with him. A week later, with the antibiotics and a phone call from Dr Clark, herself, and a card from the staff, Caesar is back to his normal self and I grew to loving this hospital! Dr. Clark is amazing and everything you expect you’re veterinarian to be. Thank Angel Animal Hospital for all you do! They made me a new patient appointment within 2 hours when my cat had a health emergency. Dr. Leto is wonderful, but I have had some communication struggles with some front desk staff. There was a delay with one of my cat's presriptions. Very frustrating! I love taking my dogs here. They are so great with them and you can tell all of them genuinely love animals which is a great thing to have. I will bring my dogs here any time I need something. Dr. Clark is amazing! She takes time with your pet to make sure she doesn't miss anything. She always listens to your concerns, answers your questions, and truly cares about your pet. I will never take my dog Lucy to any other vet. This place is amazing. The always treat you and your pets with care and respect. The doctors there will be as honest with you as you let them.. if you want what is best for your pets listen. The are also an amazing place to board your pets. Not the cheapest place in town but well worth the price. Angel Animal Hospital has helped us give the love and care our rescue pupps deserve. They treat each animal as their own. We recently lost a pup, and they all took the time to wish their condolences. Some people want the best price on vet care, but I'd rather have a staff that actually cares. Thank you AAH. Really love this vet. My dog is an anxious pup, and he actually loves coming here. He is all wags, and super happy. They are kind, take their time, actually talk to you and your dog, without making you feel like just an appointment. They also offer holistic products and really have your pets' well-being in mind. I also find their pricing some of the most fair in town. Can't recommend enough. The vets here are so caring, and excellent with pets and involving children. They go over all the options and are mindful of the dogs age and your budget. They aren't the cheapest, but they don't gouge you. For more expensive medicine they wrote me a script so i could get it cheaper somewhere else. They definitely try to help as much as possible. Our veterinarians and staff are deeply committed to the human-animal bond and the health and well being of your pets. We think of our pets as family and love animals as much as you do! In the event your pet is sick or injured, our veterinarians and staff are available to assess your pets needs and help to get you both back home as soon as possible. While under anesthesia, your pet’s vital signs are being monitored by a veterinary nurse/registered technician, their body temperature and vascular system are supported, and personal attention is given during a fully monitored recovery. We offer digital radiology for both full body and dentistry. Digital radiology offers multiple benefits including greatly reducing the amount of radiation exposure to your pet and our staff members. If your pet requires anesthesia in order to obtain radiographs, this also reduces the amount of time required under anesthesia. Cleared by the FDA, this deep penetrating light allows relief of pain through the release of endorphins and stimulates the injured cells to heal at a faster rate. Got questions about your pets and/or our services? We’ve got answers! Dr. Piper has practiced veterinary medicine in the South Indianapolis/Greenwood area for 23 years. 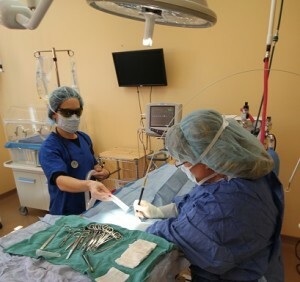 Believing that animals are truly God’s blessing in our lives, her goal with Angel Animal Hospital was to create an environment that the pets, owners, and team members enjoy. Dr. Lehmann is a graduate of Purdue University and a new resident of the Indianapolis area. She joined the Angel staff in the fall of 2015 and is glad to be a part of a comprehensive medical team. Dr. Lehmann enjoys working with exotic and pocket pets in addition to cats and dogs. Dr. Jessica Leto graduated from Louisiana State University’s School of Veterinary Medicine in 2008 and practiced several years in Louisiana prior to moving to Germany with her husband to practice for four years. Yay! More great customer reviews! We Have Dog Boarding and Cat Condos. Fair Southside Prices! Reminiscent of the Hemingway House in Key West, our cat condos offer a unique and relaxing experience for our feline guests. In a separate quiet area we have large hotel style suites with special amenities. At Angel Animal Hospital, our philosophy is to offer the best care and services to our clients in a safe, friendly, and state of the art facility. We feel strongly that each client should understand the condition of their pet(s) and their options in care. In these stressful economic times, we sometimes have to make difficult choices and it is our goal to help in every way possible.